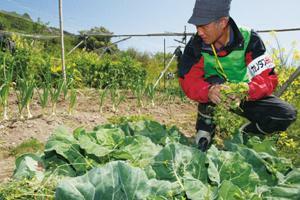 Caritas Japan through Sendai Diocese Support Center provides assistance to agriculture of local residents. In March 2011, one of the worst earthquakes in recent memory triggered a massive tsunami off the northeast coast of Japan. The tidal wave killed thousands of people and destroyed huge swaths of seaside towns. Caritas Japan immediately began helping survivors. It mobilized over 2000 volunteers to help clean debris, distribute needed items like heaters, and provide psychosocial care for the traumatized. Learn more about Caritas’ response by exploring the features here. Thousands of people in Sakuma’s town, Kamaishi, suffered intense trauma while escaping the tsunami. They also lost their homes. In the year since the catastrophe, Caritas Japan has helped them not only with emergency needs like hot water, but also with moral support. More than 2500 people have volunteered for Caritas Japan programs helping survivors of the March2011 tsunami. Here, a Caritas coordinator describes what the volunteers do–and what motivates them.